Abloco supplies wireless IP video solutions, integration and network engineering services to clients worldwide. Llamawerx focuses on design, integration and custom software development for networked and wireless technology. 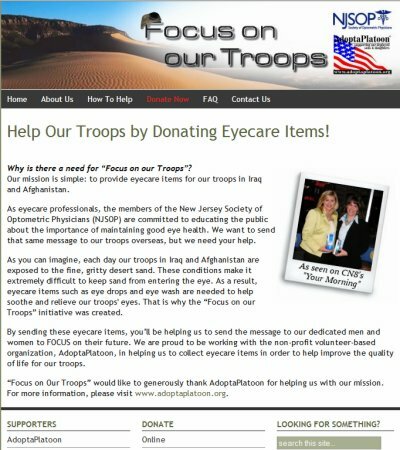 Llamawerx and the New Jersey Society of Optometric Physicians proudly announce the launch of www.focusonourtroops.org – a website supporting the campaign to provide eyecare items for US troops in Iraq and Afghanistan. As eyecare professionals, the members of the NJSOP are committed to educating the public on the importance of good eye care. With “Focus on our Troops” they want to send that same message to our troops overseas, but they need your help. By sending eyecare items or making a monetary donation, you’ll be helping send the message to our dedicated servicemen and women to FOCUS on their future. For details on how to help, please visit www.focusonourtroops.org. Doug Griswold, CEO of Llamawerx, is featured in the January/February 2008 issue of M2M magazine with an article titled Where to Put the Smarts in… SMART SERVICES. If you haven’t seen the new, improved M2M website, I suggest you visit it at www.m2mpremier.com. Print subscriptions are free to qualified M2M professionals. Llamawerx is involved with a cellular-based, mobile M2M asset-tracking application where we are responsible for the embedded software. While working on this, I became interested in the IT tools needed to create a functioning system and thought I would look into building a technology prototype. The first order of business is to select an architecture and map the functions into it. For this example, consider a smart unit that collects data remotely, does some processing and transmits position and alert information to a server. The server collects the information, stores it in a database, performs further analysis and presents the information via the web-browser. The unit and the server communicate with GSM/GPRS. The remote unit must collect positioning information from a GPS receiver, monitor input/output signals, perform analysis and communicate with the server over GPRS. To reduce costs, a Wavecom wireless processor handles the communications and processing needs. The major M2M module vendors – Wavecom, Telit, Siemens, Motorola and Enfora – offer programmable modules that are more than wireless modems. Developers program Wavecom’s OpenAT environment in the “C” language using an Eclipse IDE. The server collects information from the remote units, stores it, performs analysis and delivers it to a dashboard-like web browser application. We selected Ubuntu Linux, a robust and popular open-source operating system, as the foundation for the server software. The remote units deliver their data using GPRS and UDP, and a Python script collects the messages and stores them in a database. MySQL, another popular open-source tool, is the database server. For web access, Apache came with our Linux distribution so why change? PHP provides the server-side scripting. One approach brings multiple experts and project managers together to create the solution. Increased project management, complex architecture and difficulty managing trade-offs are common with this approach. In many cases experts can’t see the forest for the trees and are unwilling to make technology trade-offs for business value. Another option emphasizes generalists familiar with most of the technology – maybe not a deep understanding, but a working knowledge. In many cases, a generalist approaches the problem with a more open mind and is willing to trade-off designs in order to achieve the business value. At Llamawerx, we fall into the later camp. Yes, we are experts in some technologies like embedded software, OpenAT and relational databases, but our real strength is the ability to transform vague and conflicting information into working systems that solve real-world problems. For more details on Llamawerx visit the technology and solutions on our website. Llamawerx and the North Carolina State Council of Epsilon Sigma Alpha recently launched www.esa-nc.org – a website for North Carolina ESA members and potential members. 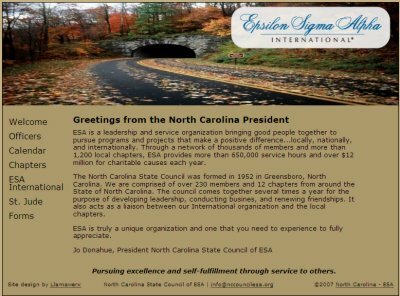 Epsilon Sigma Alpha International is a leadership and service organization bringing good people together to do good things through programs and projects that make a positive difference…locally, nationally, and internationally. Through a network of thousands of members and more than 1,200 chapters, ESA provides more than 650,000 service hours and over $18 million for charitable causes each year. In 2007, ESA raised almost $12 million for St. Jude Children’s Research Hospital located in Memphis, TN, and the leading pediatric cancer research hospital in the country. The North Carolina State Council has over 230 members and 12 chapters across the state of North Carolina.